Amanda Ullery | for the Daily Call Piqua’s Makeegen Kuhn, runs for a Piqua touchdown. Mike Ullery | Daily Call Piqua’s Garrett Schrubb makes a catch Friday night. 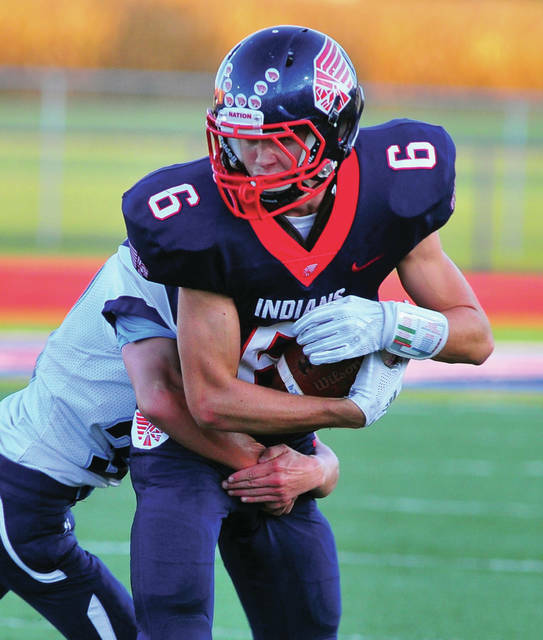 Mike Ullery | Daily Call Piqua quarterback Mick Karn rolls out Friday night. 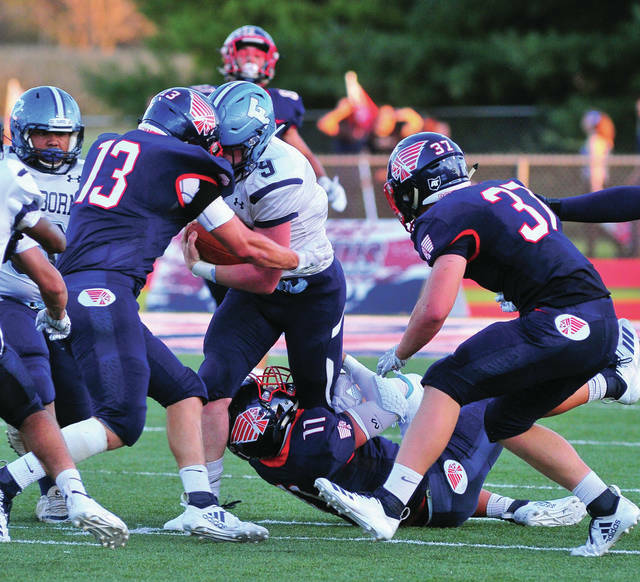 Mike Ullery | Daily Call Piqua’s Nickoah Medley (13), Mick Karn (11) and Makeegen Kuhn (37) bring down Fairborn’s Hunter Friday night. 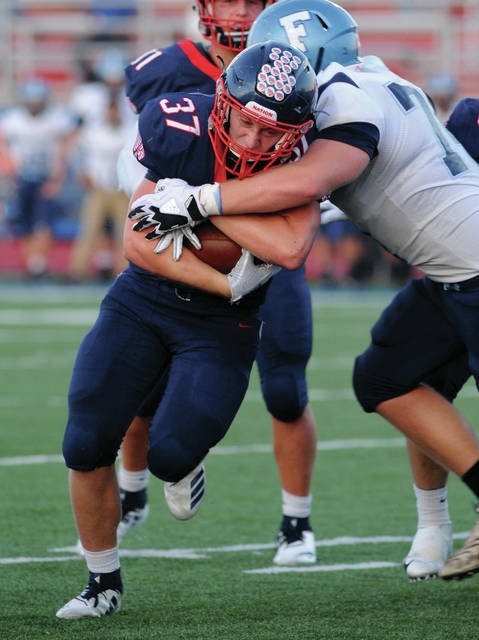 Mike Ullery | Daily Call Piqua’s Owen Toopes heads up the field with the ball. 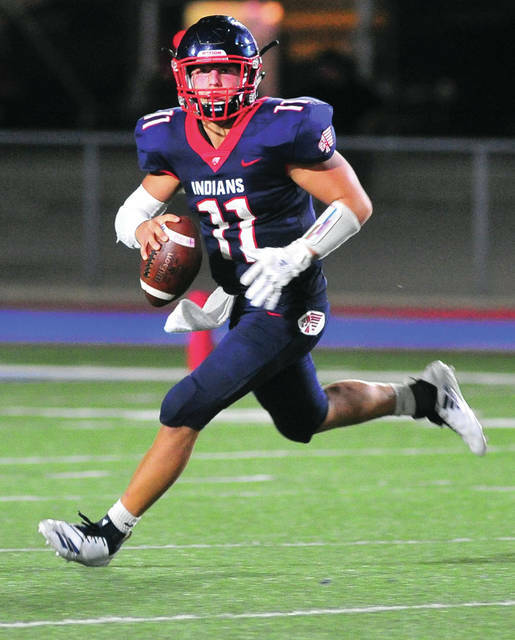 But, the Piqua football team made enough big plays to get past upset-minded Fairborn and go to 3-1 on the season with a 29-14 win Friday night at Alexander Stadium/Purk Field. Fairborn drops to 0-4 on the season. After Piqua’s second fumble, which gave Fairborn the ball on the 4-yard line and set up Hunter Warner’s 3-yard touchdown run, quarterback Garison Secrest threw to Dwight Lewis for the PAT to give the Skyhawks a 14-8 lead with 3:46 remaining in the half. But, Trenton Foster gave Piqua a much needed spark with a 77-kickoff return to the Fairborn 10. “I just followed the blocking and went with it,” Foster said. Four plays later — on fourth and goal from the two — Karn ran into the end zone. The PAT failed, leaving the game tied at 14 at the half. “That was big to give us some momentum going into halftime,” Karn said. Both teams lost fumbles in the third quarter and there was no scoring in the period. 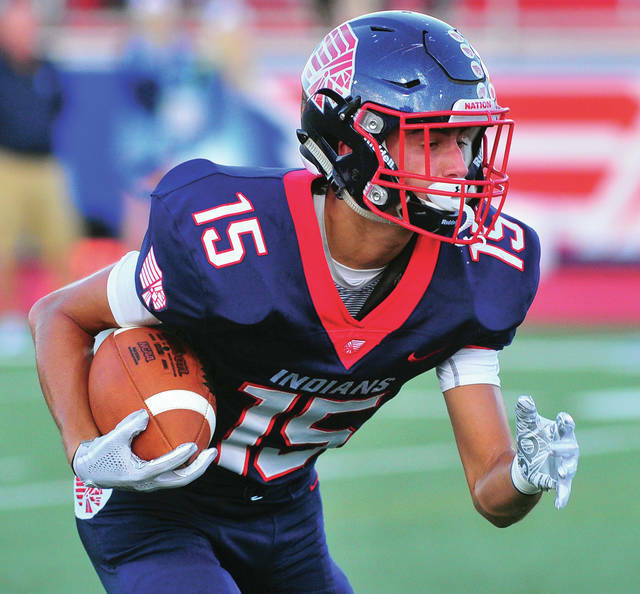 But, when Piqua got the ball back with less than two minutes remaining in the third quarter, a short pass from Karn to receiver Owen Toopes turned into a 50-yard gain as Toopes got loose on the sidelines. Four plays later — with 11:28 remaining in the game — Piqua took the lead for good when Karn ran 11 yards for the touchdown. Piqua started the PAT at the 18 after a personal foul, but pass interference moved the ball up to the nine-yard line. Karn lobbed the ball to the corner of the end zone and Owen Toopes made a circus catch, laying out and pulling the ball in as his shoulder landed just inside the end line to give Piqua a 22-14 lead. Toopes was confident he could make the catch. The Indians final score came in dramatic fashion as well. After a long punt return by Foster was called back by holding, Piqua started on the Fairborn 47 with 9:15 to go. Karn had a 21-yard run to give Piqua a first down at the 21. But, penalties put Piqua in a second-and-29. On fourth-and-18 from the 29, Karn scrambled in the backfield before spotting Owen Toopes open near the goal line. He threw a dart and Toopes went into the end zone untouched. Karn spotted Toopes at the last second. Karn’s kick made it 29-14 and that is the way the game finished. Fairborn had gotten on the board first. After Piqua”s first drive ended with a fumble on the fourth play, Fairborn went 62 yards in 14 plays. Secrest ran it in from one-yard out but the PAT failed. Early in the second quarter, Piqua went 53 yards in five plays. Karn had a 32-yard pass to Jake Meyer down to the Fairborn one. Meyer interfered with on the play, but still held on for the catch. Makeegen Kuhn ran the ball in on the next play. Kuhn then ran for the two-point PAT to give Piqua an 8-6 lead, before the second-half dramatics put the game away. Karn completed 11 of 14 passes for 170 yards and led the Piqua rushing attack with 23 yards on 14 carries. Owen Toopes led the receivers with five catches for 107 yards. Lance Reaves, Grant Toopes and Brennan Toopes all had sacks for Piqua. Reaves, Beougher and Karn all had six tackles and Grant Toopes had five. Blane Ouhl had a fumble recovery and Jerell Lewis forced the fumble. Secrest completed 16 of 29 passes for 133 yards for Fairborn, while Warner had 17 carries for 69 yards and Lewis had four receptions for 47 yards. Piqua plays at Trotwood-Madison Friday. https://www.dailycall.com/wp-content/uploads/sites/30/2018/09/web1_091418aju_fb_phs_37-1.jpgAmanda Ullery | for the Daily Call Piqua’s Makeegen Kuhn, runs for a Piqua touchdown. https://www.dailycall.com/wp-content/uploads/sites/30/2018/09/web1_091418mju_fb_phs_6-1.jpgMike Ullery | Daily Call Piqua’s Garrett Schrubb makes a catch Friday night. https://www.dailycall.com/wp-content/uploads/sites/30/2018/09/web1_091418mju_fb_phs_11-1.jpgMike Ullery | Daily Call Piqua quarterback Mick Karn rolls out Friday night. https://www.dailycall.com/wp-content/uploads/sites/30/2018/09/web1_091418mju_fb_phs_13-1.jpgMike Ullery | Daily Call Piqua’s Nickoah Medley (13), Mick Karn (11) and Makeegen Kuhn (37) bring down Fairborn’s Hunter Friday night. https://www.dailycall.com/wp-content/uploads/sites/30/2018/09/web1_091418mju_fb_phs_15-1.jpgMike Ullery | Daily Call Piqua’s Owen Toopes heads up the field with the ball.